Hacienda San Jose was built at the end of the XVII century and was one of the most affluent estates across the Peruvian coast due to its sugarcane production. Nowadays used as a tourist hotel and resort, the infamous plantation was once worked by thousands of slaves whos culture and stories are shown all over the estate. However, in all honesty, it is not what is in the Hacienda or what surrounds it that makes it such an interesting place, it’s what’s found below the Hacienda that is jaw-dropping! After entering a secret hidden staircase going down some tiny and narrow stairs, you’ll go underneath the Hacienda to find an underground secret slave tunnel covering more than 30km. This system of tunnels connects the Hacienda San Jose with four other Haciendas in the region and connects all of them the old Chincha port about 17km away. What’s the story behind these slave tunnels? By the XVIII century, the Hacienda had vast quantities of land where they grew good quality cotton and sugar. During those times, slavery was legal in Peru and the owners of the Hacienda paid for slaves from Africa and forced them to work the land, picking cotton and other agricultural products. Due to the taxes imposed by the government, the owners avoided paying import taxes by creating an underground tunnel linking the house to the port. 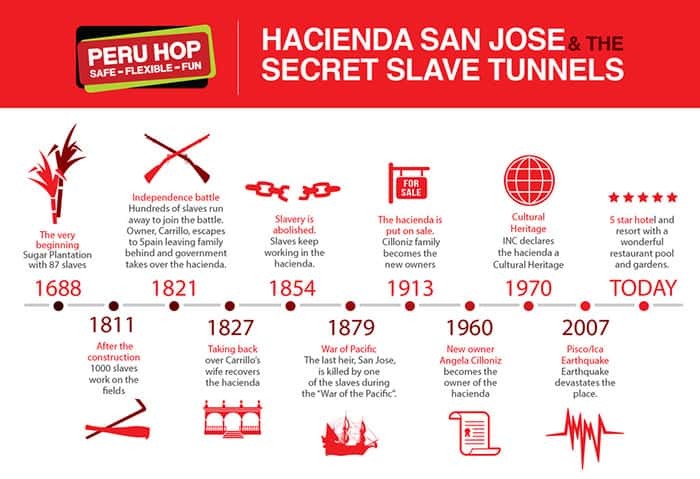 Slaves would arrive late at night to be smuggled into the hacienda via the underground tunnel, meaning that the government would have no registration of the slaves in its system. Slaves would be chosen inside the tunnels, and some stayed in the tunnels for months (many of which would die due to the harsh conditions). Once the plantation starting becoming more known and wealthy, the Hacienda became a big target for thieves and pirates sailing the Pacific Ocean. Due to the dangers, the tunnels were therefore expanded to create a number of secret escape routes throughout the house, linking the owner’s bedroom, the local church, and various other rooms with the tunnel system beneath. In the church, the tabernacle – a box-like vessel normally used for storing bread and wine for the consecrated Eucharist – opened up to be used as a secret entrance to the tunnels. When Ramon Castilla abolished slavery in 1854, these tunnels were used as catacombs for some of the workers who died on the land or from the punishments dealt out by some of their notorious owners. In the 2007 Pisco and Chincha earthquake, a new entrance to the underground tunnels was discovered after part of the floor collapsed. Two groundwater deposits were also revealed. 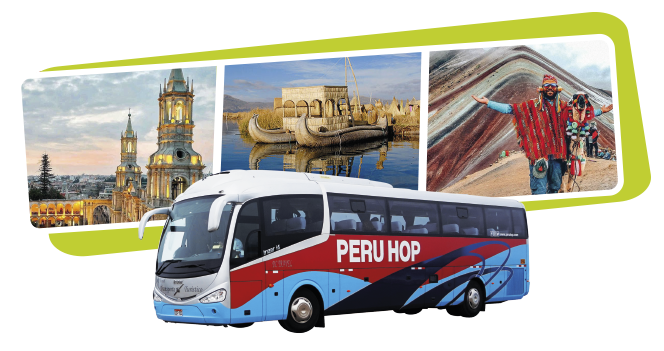 Will the Peru Hop guide teach us about the afro-Peruvian culture and the history of the Hacienda? Yes, it will be a guided tour throughout the Hacienda and tunnels all while telling you the history of the estate. Can I book the tour with a tour operator? As of now, we are the only company to organize guided tours of the Hacienda San Jose and the slave tunnels underneath on all of our passes.